All together, there are 20 different female creators set to work on 17 different comic books in March 2019, 2 more creators than in February and also 2 additional books. As best I can tell, there are no non-binary creators listed in this round of solicits. These gains are slight, and leave DC in the same range they’ve been for several months now. The low twenties are just where things are these days, and there doesn’t seem to be a huge desire to change things across the main line. Elsewhere, the DC Zoom and DC Ink young reader lines have lots of female creators in the mix, but not so much for the older readers, it seems. We do have two new names this month, though. It looks like Sarah Leuver is making her DC debut with some interior art for Teen Titans Go! #33, while Tiffany Turrill is doing the cover for Lucifer #6. Neither are working in the main superhero line, tellingly, but it’s great to have them in the mix and I look forward to seeing more from them in the future. March is a quiet month for new titles at DC. Both new series have male leads, and don’t mention much in the way of female or non-binary characters. And what’s sure to be the month’s biggest book, Detective Comics #1000, appears to be a largely male-centric affair. Men account for 22 of the 23 creators listed, with Joelle Jones as the sole woman. I understand that Becky Cloonan may be drawing a story as well, but she’s not listed in the solicits. And while I’m guessing we may get a Catwoman tale in the over-sized book, if last year’s Action Comics #1000 is any indication I wouldn’t hold up much hope for having many other female characters in the mix. That book’s lack of Lois Lane still astounds me. Overall, DC Comics is in a rut when it comes to female and non-binary creators and the March solicits aren’t doing much to change that. They just don’t seem to be a priority for the main line right now. Perhaps April will bring some changes to the line after a quiet March? All together, there are 25 female creators set to work on 24 books at DC this October, 2 fewer than in September though they’re working on 3 more books (to the best of my knowledge, there are no non-binary creators in the mix this month). While 2 fewer creators isn’t a massive change, 3 of the past 4 months have featured a drop of 2 or more, and it’s starting to add up. As mentioned at the beginning, not a whole lot has changed at DC over the past little while, so this is just an organic drift downward. A few books got cancelled, a few new books began, and that’s about it. There wasn’t another relaunch cycle or any substantial creator upheaval. So this decline is just a gradual decrease caused by small changes here and there, and little has been done to remedy this drop. We do have a few new female creators in the mix, though, which is always nice to see. Diana Conesa is going to be working on interior art for Nightwing, and I think she’s making her DC debut there. We’ve also got Lynne Yoshii, again on interior art, on the new Gotham City Garage, which we’ll discuss momentarily. Another new book, the anthology oneshot DC House of Horror, features a story by writer Mary Sangiovanni. The oneshot is one of just a handful of new books at DC in October, and it’s got a few female creators in the mix as well as some stories starring female characters, including unique choices like Martha Kent and an Amazon warrior. DC’s Metal event continues, still with no female creators in the mix and seemingly few female characters, but we’ve got two new books with female leads. The aforementioned Gotham City Garage is based on DC’s statue line of their heroines as bikers, and features a reimagined DC universe centered on biker ladies. I feel like this could go either way, really. It’s reminiscent of DC Comics Bombshells, another comic line based on popular merchandise, but while Marguerite Bennett helmed that book and turned it into a queer feminist masterpiece, I’m not terribly familiar with the two dudes writing this one. Fingers crossed it’s similarly cool. We’ve also got an unusual team up with Harley & Ivy Meet Betty & Veronica, a crossover with Archie that introduces these two famous duos for the first time. A lot of creators from the regular Harley Quinn book are on board, so expect a similar tone and sensibility. All together, there are some new names and a couple of potentially fun titles on the horizon for October, but overall the numbers keep falling. If DC continues at this pace, they’ll be back in the teens again before long, and it’s getting to the point where it feels like some intentional effort needs to be made internally to buoy their dragging representation. All together, there are 31 different female creators set to work on 22 different books in June, 3 more women than in May and 1 more book. It’s small growth, but growth nonetheless. And the number of women is relatively strong for DC, even though the number of books is fairly middle of the road. Female creator behemoths like Gotham Academy: Second Semester, Shade, the Changing Girl, and a double shipping DC Comics Bombshells are carrying a lot of the weight this month rather than the work being more spread through DC’s line. Still, this looks to be a solid showing for the publisher, and a long awaited return to the thirties after a good run there last fall. In terms of new faces, I think the cover of The Fall and Rise of Captain Atom might be Ana Dittmann’s first DC work, which is very cool. We’ve also got Brittney Williams, who we’ve seen at DC before a while back; she’s coming off a fantastic run on Patsy Walker, a.k.a. Hellcat! at Marvel, and it would be rad to see more DC work from her moving forward. Eleanora Carlini’s been doing some Green Arrow work lately but now she’s moving to Batgirl, which should be fun. And Jan Duursema is back with a backup story in Scooby Apocalypse! We haven’t seen her around these parts for several months now. The new books are light on women, however. DC’s set to premiere the prelude to their big summer event Dark Nights: Metal with Dark Days: The Forge, and while the event will encompass the whole DC universe, Batman seems to be the focus here. There are also a series of Looney Tunes superhero crossover specials, but Wonder Woman’s the only solo female character in the mix. Also, somewhat oddly, there’s a Steve Trevor special set for June. Wonder Woman will be in it, I’m sure, but focusing on him seems like a bizarre focus during a month when her first big screen solo outing is set to debut. Overall, June is looking decent for female creators at DC. There aren’t many new books in the mix so the ranks are fairly stagnant, but things have ticked up slightly for the third straight month and DC is in the ballpark of its past highs. A lot of this is powered by just a handful of books, though, so it’ll be interesting to see how things unfold in the coming months; more growth across the board would help make this current mini-surge more sustainable. All together, there are 27 different female creators set to work on 21 different books in February 2017, one more female creator than in January though 3 fewer books. Both months of 2017 have been in the high 20s, but DC’s solicits were in the low 30s at the end of 2016. It’s a light step down for the publisher, and the continuing unfolding of the second phase of “Rebirth” doesn’t seem to be growing the female creator ranks yet. Part of the reason for the numbers not changing much is that there aren’t really any new women in the list above. It’s a lots of returning favourites and people we’ve seen recently; everyone’s a regular. There are folks in new gigs, however. Bilquis Evely is taking over as the artist on the even-numbered issues of Wonder Woman, and Marguerite Bennett is penning a Batwoman series. Speaking of, there are a few new books with solid female character representation. Batwoman is the only female-led solo title set to debut; it premieres with a “Rebirth” issue this month, and then the regular series should launch in March. A couple of new team books have a lot of women in the mix as well, including The Wild Storm reboot, which name checks Angela Spica, Jenny Sparks, and Voodoo in the solicit, and the new Justice League of America, which counts Black Canary, Killer Frost, and Vixen as members. Overall, is a fairly steady month for DC, with relatively decent female creator representation. The drop in the number of books is a bit disheartening; that’s the lowest number of titles since September. But the ranks as a whole are holding firm, and remain above where DC was when “Rebirth” began . DC’s previously shown that they’re capable of higher numbers, and perhaps the second wave of “Rebirth” will continue and help the publisher reach and perhaps surpass those totals. All together, there are 33 different female creators set to work on 23 different books at DC this December, the same number of women as in November and one more book. The total also ties DC’s highest number of the year, and it’s an encouraging sign for 2017 that DC is set to end 2016 with two very good months. With the second wave of “Rebirth” just around the corner, hopefully the publisher can keep these numbers going. December looks a lot like November across the board: a core group of creators, plus a few one-shots and variant covers. One-shots aren’t sustained work, but DC’s mixing things up with their variant covers as of late. Instead of rotating in different artists each month, artists seem to be sticking with a book for an extended period of time. Emanuela Lupacchino, for example, has been doing variants for Green Lanterns since it launched in June. What used to be a one-time job has turned into steady work, and it’s helping keep DC’s female creator ranks high. December’s not a huge month for female characters, but there are a couple of fun new books in the mix. The biggest is Supergirl: Being Super by Mariko Tamaki and Joelle Jones; it looks fantastic, and with two amazing creators in the mix it should be a lot of fun. We’ve also got the DC Rebirth Holiday Special with stories starring Batwoman and Wonder Woman, and the beginning of Justice League vs. Suicide Squad, which will feature all of the female members on both teams. Overall, DC is set to end the year on a good note. Things were looking bad mid-way through the year; DC could barely hit 20 female creators a month in the early days of their “Rebirth” initiative. But things have picked up throughout the fall and DC is going to close 2016 with the best numbers we’ve seen from them over the past five years. There’s always still room to grow; women remain a small minority at nearly every level of production. But progress is slowly being made, and things are looking up. All together, there are 25 different women working on 22 different books, the same number of books as last month but a drop from March’s 28 different woman. It’s a slight decline, but numbers fluctuate. While three fewer women is more than you’d like to see, it’s not a massive drop by any means, and 25 is pretty par for the course at DC lately. There aren’t a lot of new names in the mix for April, but I think that Eleanor Carlini might be new to DC. Plus, it’s always fun to have creators like Colleen Coover, Faith Erin Hicks, and Jill Thompson pop into DC to do some work. DC’s compiled a pretty solid group of women who work on their books each month now; there are lots of steady gigs in the mix here. Even without guest creators or fill-ins or variant covers, DC would be at around 20 different women each month with regular creators alone. Such a permanent stable of regularly working women is good to see. For female characters, April looks to be Harley Quinn month at DC. She’s launching yet another spinoff, Harley Quinn and her Gang of Harleys, and will start in a Suicide Squad special drawn by Jim Lee. There’s not much else new for April, perhaps due to DC’s rumoured relaunch “Rebirth” this June. They might just be sticking with the books they have for now before unleashing a new slew of the over the summer. Overall, April looks to be a fairly average month for women at DC. The number of women working on their books isn’t low, relative to past months, but nor is it particularly high. While DC’s hit on a fairly consistent range, an upward trajectory, however slight, would be much more encouraging, especially considering that 25 women still make up a very small minority of all of DC’s creators. Perhaps the “Rebirth” relaunch will shake up these numbers for the good. 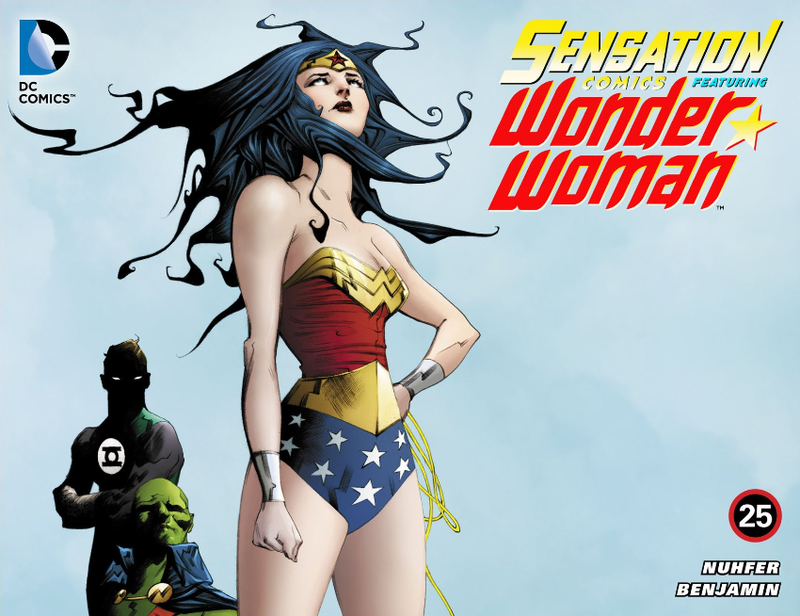 Sensation Comics featuring Wonder Woman #25 is easily the best Wonder Woman comic I’ve read this week, though it’s a fairly low bar. Both Wonder Woman and Superman/Wonder Woman put out bad issues yesterday, so today’s Sensation Comics felt like a breath of fresh air. It’s not the strongest outing that the series has produced, but it was a fun read and an excellent palette cleanser after a rough Wednesday for our favourite Amazon. The story begins with Wonder Woman saving an Indian space exploration laboratory from a meteorite strike and learning that LexCorp was behind the attack. Wonder Woman spends the rest of the issue preventing LexCorp from derailing the launch of India’s newest space mission. She stops Luthor’s sabotage, while the shuttle’s female pilot safely executes the mission despite Luthor’s attempts at interference. It’s a fun story, though it feels somewhat overstuffed. One digital issue isn’t a lot of space, and while Heather Nuhfer puts in a lot of good moments, there are also a lot of sharp jumps and confusing transitions that make it a bit of a jarring read. Space is at a premium in such a short book, and there are a few odd choices that use up a lot of valuable real estate. For example, dedicating two pages to Lex sabotaging the shuttle is more than necessary, and some of that space could have been perhaps better used finessing what is an awkward transition into LexCorp robots attacking Wonder Woman’s invisible jet. You’ve got to maximize the space available. At the same time, though, the book’s best sequence is the four opening pages dedicated to Wonder Woman destroying the meteorite that’s heading towards the laboratory. It’s a fantastic showcase of Wonder Woman’s strength, and Wonder Woman’s annoyed question, “Why can’t this ever happen over an empty field?” is a particularly nice touch. This scene doesn’t maximize the book’s limited real estate at all; it’s eight panels spread out over the four pages. But it works like gangbusters. It’s a dynamite way to open a comic book, and it shows that sometimes you’ve just got to explore the space a bit, even though the book feels a bit cramped from then on. I love the focus on her eye that shows she’s seeing the full situation and has it handled; there’s no panic or fear, just a look back to make sure she’s still got the space she needs. And the blur with the sparks to show the fieriness and speed of the meteorite look so cool, and serve as a great frame for her laser focused eye. All of the choices in the this panel work beautifully. Benjamin’s art throughout the rest of the book is strong as well. He draws a great Wonder Woman and a sinister Lex Luthor, and does a good job with the evil robots and their space shenanigans. Benjamin colours the book as well, and makes a few odd choices. The overall tone is perhaps a bit too yellow for my taste. It’s in a mid-range between a bold stylistic choice and normal colouring, and I think he’d have been better served by either colouring the book realistically or going full on stylistic. However, the colouring on that spectacular opening sequence is fantastic, especially the way Benjamin communicates the heat and speed of it all. Overall, this week’s Sensation Comics was a fun outing with some good moments. It was a bit rushed, but so it goes with digital oneshots. It’s just not a lot of space. The print version of this story hits stores on March 18 in what should be a great issue all around, so definitely keep your eyes peeled for that.